Vigorous plant, excelling if grown on two stems, with clusters carrying 7-9 fruits. 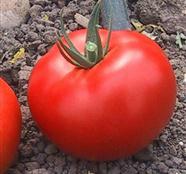 Nice red jointed fruits, globe to deep oblate in shape, 200-240 gr. in weight. Fruits maintain excellent firmness and uniformity at high clusters. Dina F1 is mostly recommended for long over-wintering plantations.